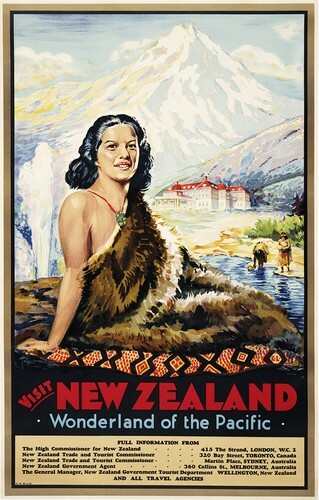 In an age before television and the internet, posters on billboards, in railway stations and on buildings in towns and cities throughout New Zealand were the mainstay of advertising. In the early twentieth century, their popularity and success in selling the dream of the country’s landscape and its numerous attractions to New Zealanders and international travellers was made possible by new technologies and central Government support. New printing processes, including lithography and screen-printing, saw the introduction of illustrations and colour in popular publications. Posters promoting theatrical performances and commercial items were increasingly visible from the early 1900s, reaching their golden age in the 1930s. The exhibition features a series of short interviews and a 15-minute documentary Graphic Wonderland which explore the art, skills and techniques of commercial artists during the period. The documentary also goes behind the scenes of the industry with fascinating footage illustrating the work of commercial studios including the National Publicity Studios and Railways Studios.